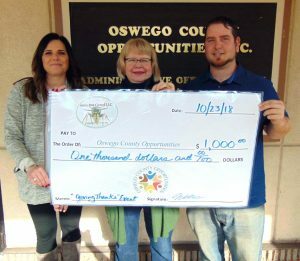 OSWEGO, NY – Oswego County Opportunities welcomes Amity Pest Control as a Silver Level sponsor for OCO’s upcoming “Giving Thanks” fundraiser in support of its “Success4Families” campaign. From left are OCO Development Coordinator Bridget Dolbear, OCO Senior Director of Operations Betsy Copps, and Nik Parmelee of Amity Pest Control. “OCO has always been a great partner to us here at Amity Pest Control. We are honored to be a part of their Giving Thanks event and helping them in their mission to provide services to the families in our community. We are proud to be Oswego County’s local pest control service,” said Nik Parmelee. OCO’s “Giving Thanks” fundraiser, a food pairing event featuring signature dishes from the area’s most popular restaurants paired with wine and beer samples to complement each dish, will be held November 2 from 6 to 9 p.m. at the Lake Ontario Convention, Event and Conference Center in Oswego. Proceeds will be used in support of OCO’s “Success4Families” campaign, which will help fund a variety of services that feed, clothe and house families in need as well as empower, support and equip families for success.